This topic contains 35 replies, has 11 voices, and was last updated by MarcH 02/11/2019 at 3:59 pm. Has anyone tried out the new 1500 grit diamond stone already? Since they come from the same manufacturers as the 100-1000 stock stones (unlike the 300 grit DMT stone, which I don’t like), I have high expectations for them. I think I’ll order a pair next Monday . Who’s gonna be the first to report? I was looking hard at them yesterday. Which lapping film micron size should be used after this 1500 stone? In theory it should be 6 micron, but Clay used 6 micron after 1000 grit stone. I actually just ordered them . I think I’ll use the 6 micron diamond film after the 1500 grit stones, once they are broken in. 1500 grit should be equivalent to slightly more than 3 microns, so 3 micron should work if you follow the grit-size-only logic. However, different abrasives work differently (stones may be more irregular or make deeper scratches – a similar thing applies when moving from stones to strops), so it’s usually good to take a step back. 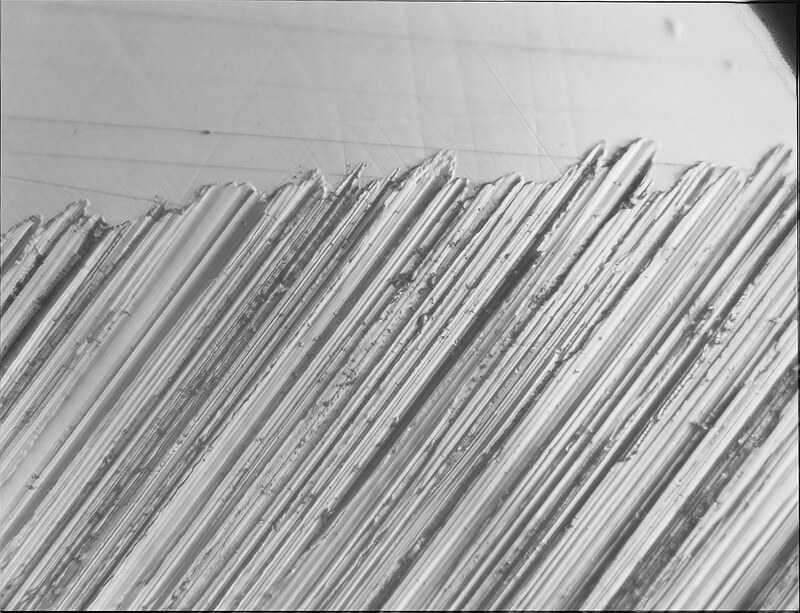 I’ll do some sharpening and study the results under the microscope today to examine the films after the 1500# stones. BTW, I love the stones. The image above shows the shoulder and bevel intersection. I polished the shoulder down to .5µ without spending too much time trying to make it perfect. 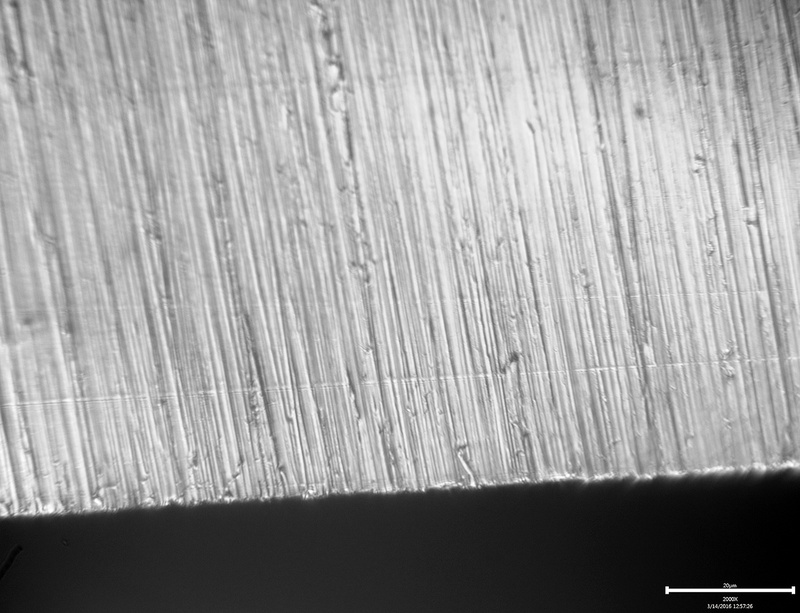 Most of the widest scratches measured between 2.5µ and 3.5µ from ridege to ridge. 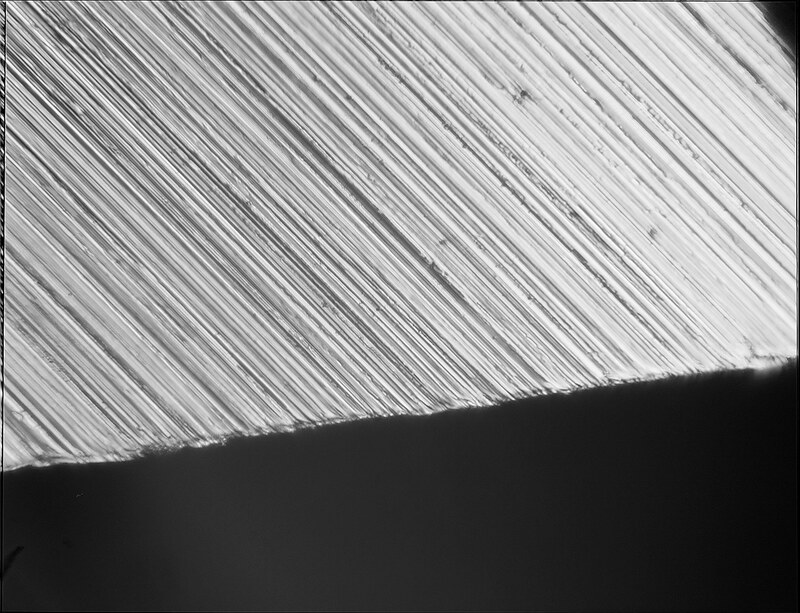 This images shows the edge at 2000x. 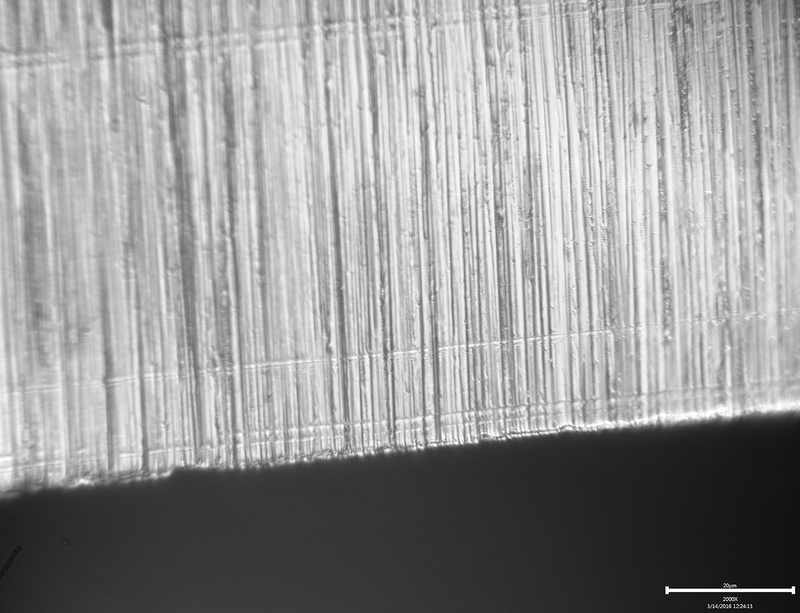 The widest gaps between the teeth also measured between 2.5µ and 3.5µ from ridege to ridge. Both images are stacked using the microscope softwares EoDF function which saves me a bunch of time from doing it in Photoshop. I only used 3 images for each stack. Next I’ll use the 9µ on the bevel and image the results. After that, I’ll restore the 1500# scratch pattern and then use the 6µ film. Looks good! 2.5µ – 3.5µ is about the range I’d expect the scratches to be. Great pics by the way! That EoDF function works very good. 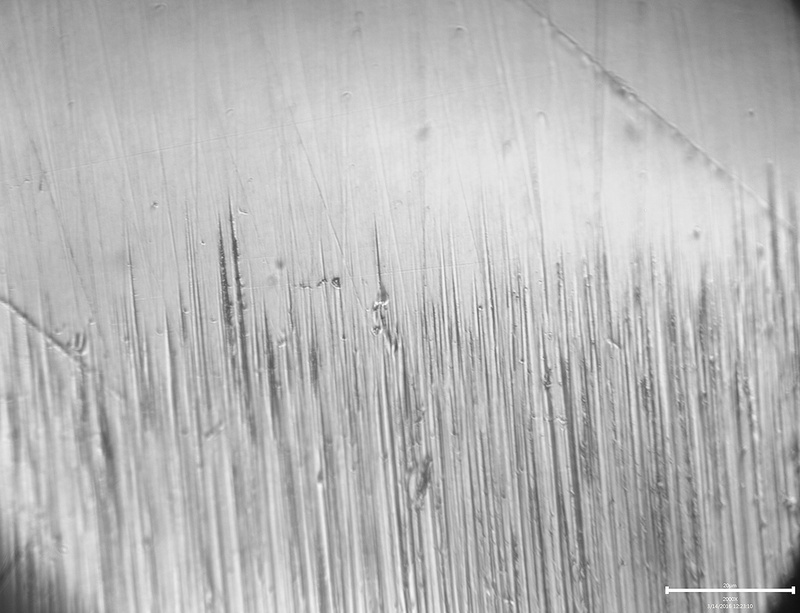 The scratches mostly measure around 1 micron and you can see the edge is much cleaner. I’m surprised that the scratches are so small. After that, I’ll restore the 1500# scratch pattern and then use the 6µ film. with the same number of strokes. 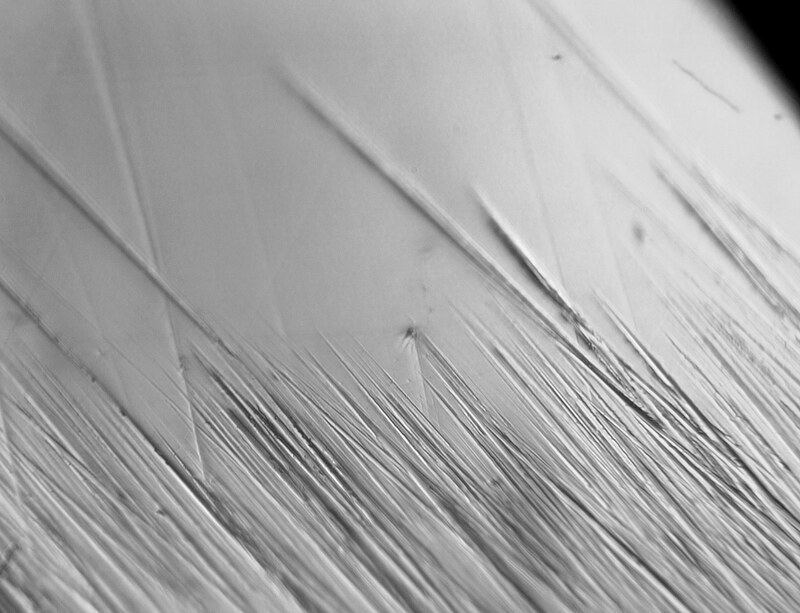 The size of the scratches produced by the 6 micron films are between 0.70µ to 0.95µ. I just reestablished the 1500# bevel and then did 10 strokes per side with new 9µ sheets, which also erased the 1500# scratches and was very similar to the 6µ pattern just larger scratches. My conclusion is that the 9µ film is unnecessary if you have the 1500# stones and the jump to the 6µ films is appropriate. If you want to sharpen ceramic knives, then I’d definitely include the 9µ after the 1500#. I didn’t do a great job of cleaning the sample prior to imaging it, but it still gives the idea. 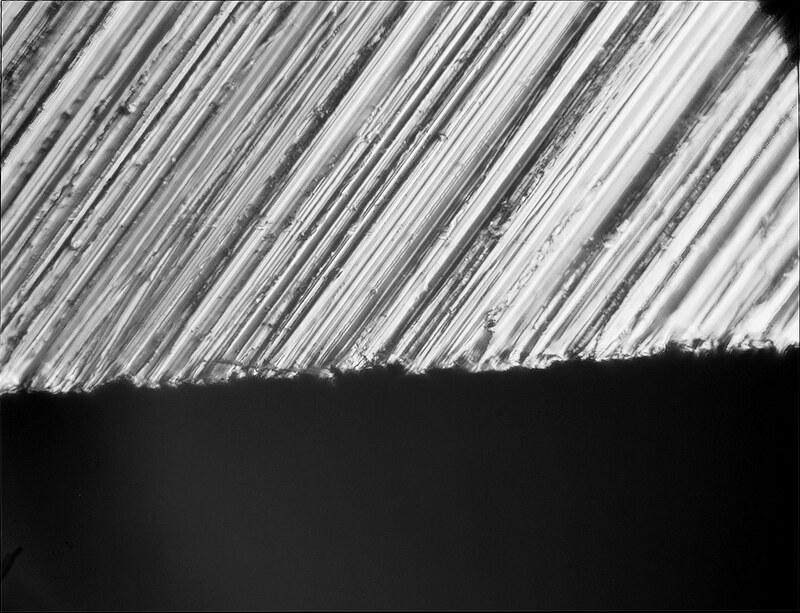 The majority of the scratches with this film are between 0.20µ and 0.35µ. There were a couple of outliers at around 0.50µ. Clay, are you using a oil immersion 100x microscope lens in these photos or a 100x Dry? They look great! As always, the diamond films really impress me with their speed and consistent patterns. I’m also surprised their scratches are so narrow, yet easily erase those of the 1500 grit stone. That stone also looks great. I think 9µ film after the 1500 grit stone is a perfect progression, even though 6µ seems to work as well. I’m glad I just ordered the 1500 grit stone and the 9µ film .